So, speaking of small world, a few weeks before we left, Sadie, with whom I biked down the west coast last June, posted on facebook that she was leaving soon for Alaska! But I’m about to leave for Alaska, too, I messaged her immediately. 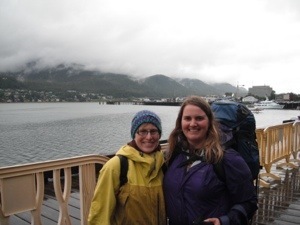 We cross-checked schedules and discovered we would be in Juneau on the same day! I started the day with stretch class at 7am, which was a nice warm up for yoga on my own. Sadie texted that she would meet me at 10am at the Sandpiper Cafe.  I figured they’d have wifi, so I got there early and got one blog post finished. It was very exciting to meet Sadie’s boyfriend. He had lived in Alaska for a few years, and was very interested in moving back. He had a lot of information about the areas we were visiting, and it was not surprising to find out he works as a programmer. Sadie and Krishna had to get to the airport, so after brunch I jumped on the Blue Bus to the glacier. Justin, one of our trapeze instructors, used to live in Juneau and told me about this bus. Other than that, I did very little research for this trip because I imagined I’d have ample down time to lounge around on deck and surf the web. Not possible. There will never be free wifi on the ships, one of the fitness guys told me. It would keep people from spending money. Whether through being informed consumers, or just from having something to do with their time, I guess he’s right. That’s what pretty much everything on the ship is like. Put your money in your hand, so we can come and take it from you! And a surprisingly high percentage of people seem happy to do this. But we’re on the cruise for a family vacation, with 15 of us traveling together. It works really well for us to have dinner together each evening, and then we can do activities throughout the day or in port in smaller groups or on our own. It’s fun to run into each other and share intel on snacks or hang out for a while when wandering around the ship looking for new places to nap. 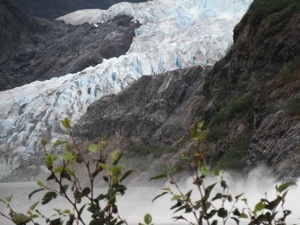 But it was nice to know about the bargain bus to the Mendenhall Glacier. My ride out was a private trip. The driver told me how he just up and leaves sometimes. Once he hitchhiked to Seattle, then Spokane, across Idaho and most of Montana. At the visitor’s center, I checked out the trails. The east glacier trail went into the woods, not to the Glacier. The Nugget Falls trail went to the bottom of the falls, not to the Glacier. The west glacier trail went closer to the glacier, but the trail head was several miles away at the other park entrance. I took off on the falls trail. It was crowded with many cruisers continuing their habit of stopping in the middle of the path and blocking the way. But there was a lot of moss and wildflowers as I wound through the newer deciduous forest, which had formerly been covered by the glacier. 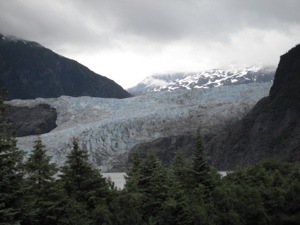 Up higher, you could see the older coniferous forest which had not been under the glacier at one time. At the end of the path, I picked my way around a boulder field to find a better view of the glacier and the falls. It looked like I could almost make my way around the falls. Well, if I had climbing equipment I knew how to use. I can dream, can’t I? I took lots of photos and headed back. I had practically returned to the starting point when I came across Ben and Becky, so I turned around and went back down the trail with them. 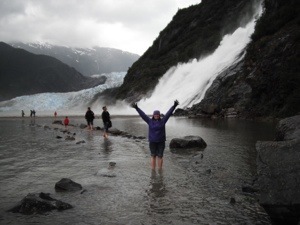 Becky took of her shoes to wade through a stretch of frigid water and get a better view of the falls. Ben and I stayed back to shiver, and we got to see a kid fall in, whose dad told him not to stand on that slippery rock. As the three of us reached the end of the trail, we discussed what to do next. Ben and Becky had been scheduled to take a helicopter ride on to the glacier, but it had been cancelled due to the weather. They were really disappointed, but had jumped on a last minute whale watching trip and had seen on orca family up close, which even got their guides excited. Then I got a text from Sadie– their flight was actually for the next day and they were returning to town! I rushed back to meet them. 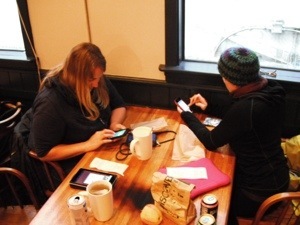 We had Mexican food, dug around a used book store, visited a natural foods store, and sat in a coffee ship and used the wifi. Just like old times! I didn’t see whales up close or set foot on a glacier, but I got to spend the day with Sadie, which is how I really like to travel!